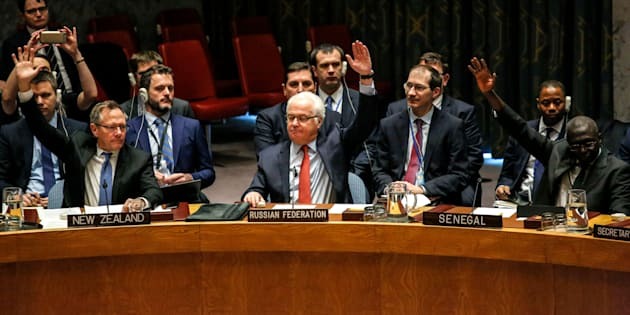 Russian Ambassador to the UN Vitaly Churkin (C) votes at the Security Council on a Russian-Turkish peace plan for Syria, on Dec. 31 at UN Headquarters in New York. WASHINGTON (Reuters) - The United Nations Security Council on Saturday unanimously adopted a resolution welcoming a ceasefire in the Syrian civil war brokered by Russia and Turkey. Russia and Turkey announced the ceasefire this week, the third truce this year seeking to end the nearly six years of war in Syria. The resolution also welcomes plans for talks to take place in Astana, Kazakhstan between the Syrian government and the opposition, ahead of the resumption of U.N.-brokered talks in Geneva in February. In remarks after the vote, several delegates on the Security Council welcomed the ceasefire but said the agreement contained gray areas and that its implementation was fragile.